When Ukrainian President Petro Poroshenko ran for the top office in 2014, he promised voters he would sell Roshen, Ukraine’s largest candy business, so he could devote his full attention to running the country. “If I get elected, I will wipe the slate clean and sell the Roshen concern. As President of Ukraine I plan and commit to focus exclusively on welfare of the nation,” Poroshenko told the German newspaper Bild less than two months before the election. Instead, actions by his financial advisers and Poroshenko himself, who is worth an estimated US$ 858 million, make it appear that the candy magnate was more concerned about his own welfare than his country’s – going so far as to arguably violate the law twice, misrepresent information and deprive his country of badly needed tax dollars during a time of war. Poroshenko did this by setting up an offshore holding company to move his business to the British Virgin Islands (BVI), a notorious offshore jurisdiction often used to hide ownership and evade taxes. His financial advisers say it was done through BVI to make Roshen more attractive to potential international buyers, but it also means Poroshenko may save millions of dollars in Ukrainian taxes. In one of several ironic twists in this story, the news about the president’s offshore comes as the Ukrainian government is actively fighting the use of offshores, which one organization says are costing Ukraine US$ 11.6 billion a year in lost revenues. Details about the Roshen deal can be found in the Panama Papers, documents obtained from a Panama-based offshore services provider called Mossack Fonseca. The documents were received by the German newspaper Süddeutsche Zeitung and shared by the International Consortium of Investigative Journalists (ICIJ) with the Organized Crime and Corruption Reporting Project (OCCRP). And in a more painful irony, the Panama Papers reveal that Poroshenko was apparently scrambling to protect his substantial financial assets in the BVI at a time when the conflict between Russia and Ukraine had reached its fiercest. Poroshenko’s action might be illegal on two counts: he started a new company while president and he did not report the company on his disclosure statements. “The company will be the holding company for his business … and will have nothing to do with his political activities,” Ioannou wrote, inquiring whether the registration agent would accept the job. Seventeen days later, a new company with Ukrainian origins was submitted to the local registry of the British Virgin Islands. A scan of Petro Poroshenko's passport from Mossack Fonseca's internal files. Called Prime Asset Partners Ltd., a name similar to that of Poroshenko’s Ukrainian holding company, it was located in the Akara Building in Tortola, an address used by thousands of offshore companies from around the world. The sole shareholder of the company was Poroshenko with an address in Kyiv. A copy of his passport confirmed that the beneficial owner was indeed the Ukrainian president. Mossack Fonseca records specify that Prime Asset Partners would serve as the holding company for the Ukrainian and Cyprus companies of Roshen confectionary corporation, with “proceeds from the business trade” of the corporation being its source of funds. Oleksii Khmara, executive director of Transparency International Ukraine, told OCCRP that this is a big problem, calling it a conflict of interest and apparent violation of both the constitution, which bans the president from business activities, and the corruption laws, which ban all public officials from conducting private business. The president also failed to report the newly registered BVI company and additional companies in his 2014 asset disclosure statements, a second possible violation of the law. The information is also missing on the 2015 asset forms. 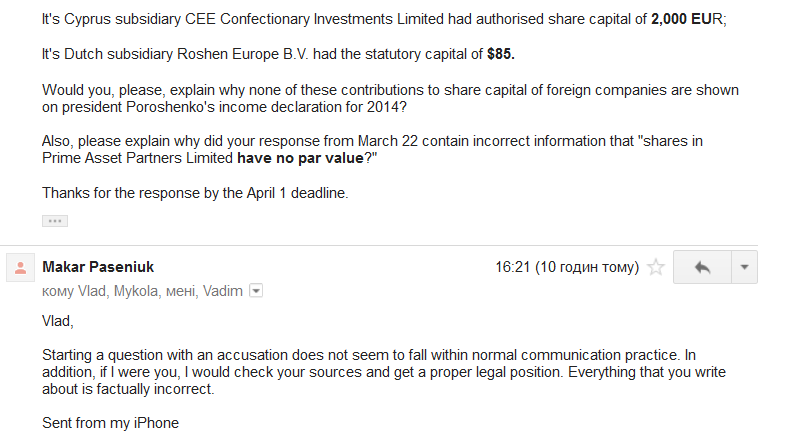 The Kyiv-based financial service group ICU (the president’s financial advisers) disclosed there were two more companies: one in Cyprus called CEE Confectionery Investments Ltd., registered in September 2014; and a second, registered in the Netherlands in December 2014, called Roshen Europe B.V. The BVI holding company holds the Cyprus company which in turn holds the Dutch company. Meanwhile, the president’s income declaration for that year gives no mention of either foreign income, or investment in the statutory funds of foreign companies. Share Register for Prime Asset Partners Limited. But the documents obtained by OCCRP show that starting from the registration date of Aug. 21, 2014, Prime Asset Partners Ltd.’s shares indeed had a total value of US$ 1,000 and listed Poroshenko as the sole shareholder. Its Cyprus subsidiary CEE Confectionary has shares with the total value of €2,000, while the Dutch Roshen Europe has the statutory capital of US$85. While the amounts are small, they still must be reported, experts say. When Poroshenko’s advisers were asked about the discrepancy, the advisers told an OCCRP reporter that his information was inaccurate. Had the new president listed new foreign assets in his declarations at such a critical time in Ukraine’s war with separatists, it might have raised difficult questions for him. Yevhen Cherniak, an analyst with Transparency International Ukraine, looked at information provided by OCCRP on the BVI, Cyprus and the Netherlands’ companies established by Poroshenko and pointed out that the president’s 2014 income declaration doesn’t say “a single word about foreign companies” in the section disclosing company shares. Cherniak said that the failure to disclose shares held by Poroshenko in the BVI Prime Asset Partners Limited constitutes a “blatant” violation of an administrative code article “Violation of Financial Control Requirements,” which deals with the submission of false information in income declarations by public officials, as provided under the anticorruption law. He added that Poroshenko was only liable for the violation for one year and that year passed on March 30 of this year, so he can’t be fined for 2014. Certificate from Mossack Fonseca asserting Poroshenko's ownership as of December 8, 2015. The president’s 2015 declaration published on April 1, 2016, which was filed according to the old law, likewise makes no mention of his BVI company, or foreign income from selling its shares. According to the Panama Papers, he continued to be a direct shareholder holding $1,000 worth of shares in the BVI Prime Asset Partners Ltd as of December 8, 2015. No further changes to the shareholding structure were recorded throughout the rest of 2015. Poroshenko and his advisers have told an evolving story. His campaign-trail promise to sell his company was soon dropped in favor of a plan to create an independent trust to operate the company. During a news conference in Kyiv last January, Poroshenko said that in 2016 all his Roshen shares had been put in a blind trust managed by a “respectable first-league foreign bank” which will “own, control and manage the assets.” Even earlier, he made the same claim in an interview with Deutsche Welle in November of 2015, saying the trust was a done deal. Those statements now appear premature. Paseniuk also told OCCRP that the trust was still a work in progress. “The stake in Roshen will be transferred into a trust after all legal formalities are completed,” he said. On March 21, a day before Paseniuk’s letter arrived, Ukraine’s National Bank, and the country’s fiscal and anti-monopoly agencies announced they had agreed to work jointly towards “de-offshorization” of Ukrainian business. According to Global Financial Integrity, a Washington-based tax-haven watchdog, between 2004 and 2013 Ukraine lost an average of US$ 11.6 billion a year, due to illicit financial flows. In 2013, this equaled to nearly a quarter of the country’s budget. OCCRP spoke to legal and tax experts who said setting up a holding company offshore – whether for trust purposes or sale – comes with a huge tax advantage. Daniel Bilak, managing partner of the Kyiv office of the international law firm CMS Cameron McKenna, did not discuss the specifics of Poroshenko’s case but said saving on taxes is a key reason for moving assets offshore and setting up a trust. But just because politicians can sometimes create offshore trusts, should they? Knobel adds that while in general incorporating a company in a tax haven may be based on valid reasons such as lowering the tax rate or benefiting from laxer laws, many will use them for tax avoidance, tax evasion or corruption. One of the jobs Mossack Fonseca was obligated to do was due diligence to make sure that Poroshenko was not corrupt. Document show however that it did not make even a halfhearted effort to do that job. “In these cases (we need) … to verify in addition to the average: what is the political status of the country, what is said about the government, (are there any) corruption scandals,” said Mossack Fonseca’s corporate production director Josette Roquebert. Poroshenko registered his companies during one of Ukraine’s darkest periods. At the end of July and early August of 2014, Ukrainians worried and watched as Poroshenko called up reservists and warned of an invasion by Russian troops. TV casualty reports were a daily reminder of the war’s costs. To bolster the nation’s confidence, on July 26 Poroshenko invited the media to a National Guard base to film him in camouflage fatigues atop a new armored vehicle boldly firing its machine guns. His commanders were deep in planning a bold counter-offensive designed to reclaim parts of Donetsk and Luhansk oblasts from separatists. But during those dark days, Poroshenko was also busy setting up his offshore companies halfway around the world. On Aug. 4, 2014, Poroshenko’s advisers started the registration procedures in the BVI. Also in August, the Ukrainian general staff moved to recover territory lost to separatists and ordered four volunteer battalions to enter Ilovaisk, a key railway hub 40 kilometers from Donetsk. The plan was to cut a Russian supply line for the Donetsk-based separatists. The command, however, failed to act on reports that a force of 3,500 professional Russian troops had moved into the region. On August 21, 27 Ukrainian soldiers fell in what would become known as the “Ilovaisk Kettle,” victims of intense Russian rocket bombardments. That was the same day Poroshenko’s BVI holding company was officially registered. Within a week, the Ukrainian battalions were encircled and their commanders seemed unable to act for a number of critical days. Khmara says the president’s moral obligation should have been to put it on hold. The few weeks of fighting in the Kettle would lead to more deaths than in any other battle – nearly 20 percent of the soldiers killed during the war. In his response to OCCRP’s questions, Paseniuk said the transactions were planned and agreed long before the military developments in Ukraine and that the two events were unrelated. On September 1, 2014, Poroshenko announced Russia has openly attacked Ukraine. On the same day he provided Mossack Fonseca with a copy of his utility bill to prove his home address.